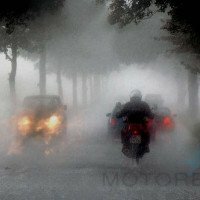 Moving and walking your motorcycle without power is part of motorcycle riding and management. 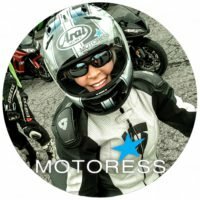 No matter what height, size or weight of the motorcycle, with practice and the right technique you’ll be able to move and walk your motorcycle with confidence and full control on any surface and in the tightest of spaces. Many riders opt to sit on their bikes and paddle it with their feet to move it. Though this might be okay in some situations it’s far from efficient. Riders also tend to opt for this method for fear of dropping their bike and who wants that to happen?! When moving it around in your garage, at the fuel station, or getting out of a parking space – manoeuvring it by walking beside it is not only faster, but far easier than you think! 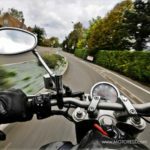 Here follows the tips and techniques on how to maneuver your motorcycle by pushing and walking your motorcycle. Be sure to start slow and take the time to practise. 1. GEAR: Depending on your helmet type and the amount of space you’re moving around in, you may want to remove your helmet to ensure full vision. Keep your gloves on to ensure sturdy grip. 2. 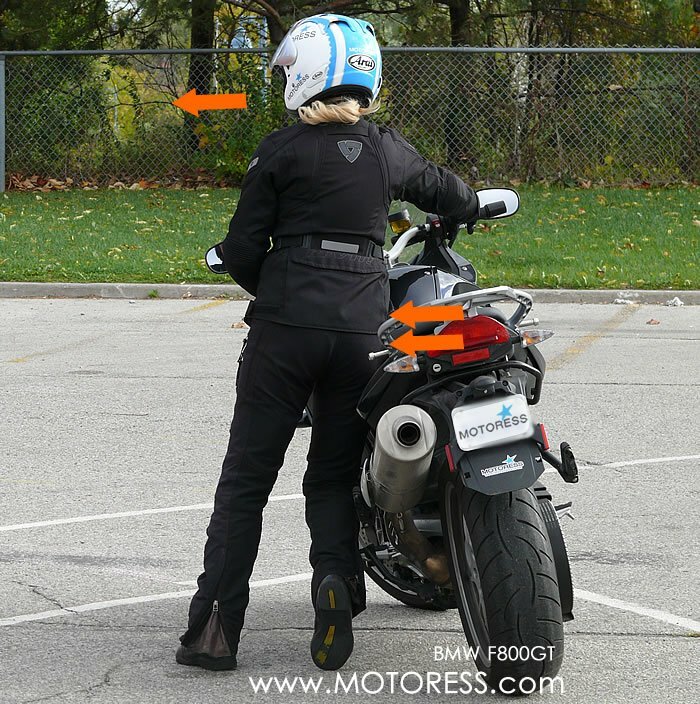 FRONT BRAKE: Stand on the left side of the bike as though you are going to get on. Hold the handgrip while covering the front brake with two fingers. You’ll need access to the brake to control any potential rolling of the bike. 3. 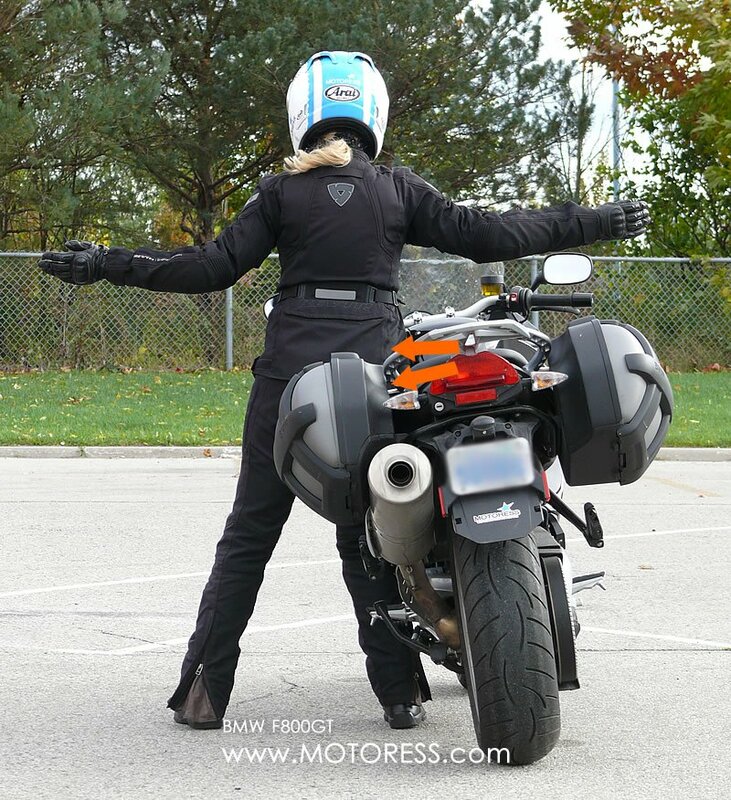 NEUTRAL: If your motorcycle is in gear, put it in neutral for ease of movement. Don’t hold the clutch in, this will interfere with maximum grip for control. 4. SIDE STAND: Lift the bike off the side stand slighting tilting the bike towards you and your body. Kick the side stand up/ deploying it. Get it out of your way. Often riders think this should stay down for when you lose balance but the side stand is a hazard in itself. If it contacts ground while you’re moving the bike it can jar it and cause you to lose balance and drop the bike. It also interferes with your footing/walking path. 5. HIP AND BODY: For balancing and managing the weight of the bike, don’t try to hold all of its weight in your hands. Lean or rest it on your hip or right side of the body so that you have a light weighted grip on the handlebars. Push your hip into the seat or tank depending on your height. This will help steer the bike. Again and depending on your bike, you should be able to fully support the weight of the bike on your upper leg and hip. 6. PUSHING: Here you can use your body as the forward push force powering your motorcycle. Many focus on power to the handlebars forgetting the body can be a big help here too. Use your hip, driving it into the tank or seat gives you surprisingly more momentum. Of course if you have a low chopper style motorcycle you’ll have no choice but to power forward by pushing solely on the handlebars. 7. FAMILIARIZE: Get used to the balance point of your bike. Upright it can balance on its own. Get a feel for this practicing in your garage or parking space on level ground. Then find out where the zone of no return is. To do this, hold onto the handlebar/grips and slowly (Very slowly!) ease/ tilt the bike away from the side of your body until the point where you feel you can no longer hold the bike upright. Of course don’t go beyond this. This helps you discover to point of no return zone. Getting a feel for your bike and its “weight character” (top-heavy, front end heavy etc.) will help and eventually allow you to manoeuvre it eventually with just one hand. Even a +300 kg touring motorcycle will feel light at its balanced point. 8. 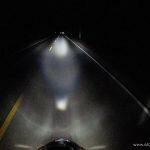 TURNING: Walking your motorcycle in straight line, like riding it, is easy. Turning requires slightly more modification. Remember to look up and to where you want to be. 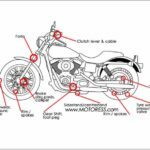 Again, lean the mass of the bike, the middle area against your body (depending on the type of motorcycle you have) with minimal stress on the handlebars. If you need to turn the bike sharply say to the left; turn the handlebars left to full lock position while stationary/not moving. Turning the steering to full lock will also provide stability. Always stop before turning the handlebars from straight to full lock and back again. The points in between are where the bike is most unstable. Remember, don’t apply the front brake when turning to the right. This will lock the steering and cause you to lose control and possibly drop the bike. 9. 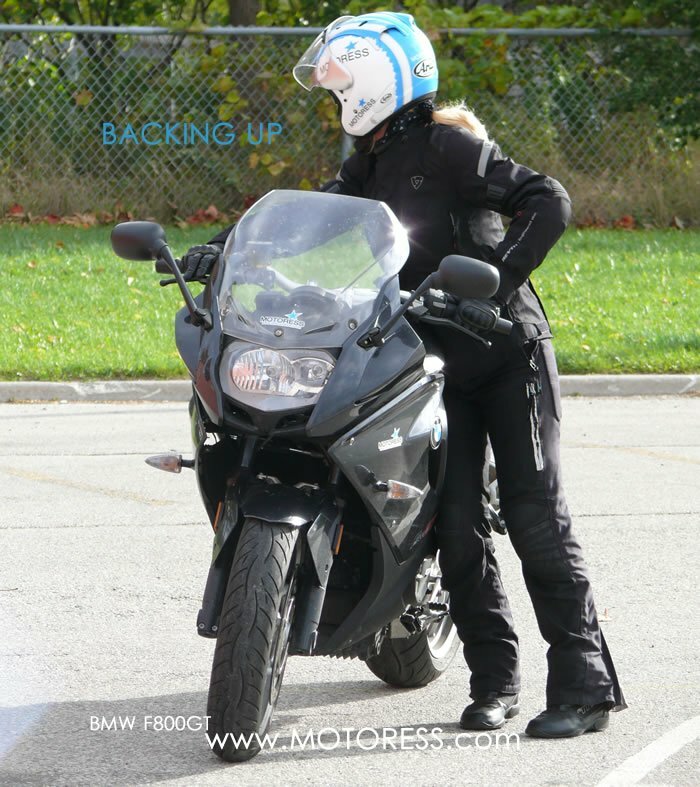 BACKING UP: 1) Simply keep the bike leaned against you and exert a bit more pulling power on the handlebars. Use your hip/upper leg again to drive power into the seat and backwards. Be sure to turn your head and look where you’re going. 2) Another method is to hold the bike by the left handlebar with your left hand, and put your right hand on the rear seat, top box or passenger seat handle to push. Though remember while doing this you will have no control of the brake so be sure you’re on level ground. *TIP: it’s often better to move forward and make a little circle rather than backing up. Once you’re done don’t forget to put the side stand down. Some use their side stand as a pivot, transferring weight onto the side stand to turn the bike around. This might look cool but it’s hard on your side stand and could even bend it. Your side stand is really not meant to take that much weight. Thinking long-term, a motorcycle without a side stand is a bigger problem for a rider! This may also drive a whole into the surface you’re turning on. Walking with power can be done easily and may be needed if moving the bike into a trailer of up a hill where you’ve not enough strength for the task. Turn the bike on and ride the clutch at the friction zone to get a slow steady speed. Keep your right hand ready to use the front brake if needed. Practise makes perfect so don’t be lazy and let your friends move your motorcycle for you or help. If you do, you’ll never hone your skills for the task. Even when you’re in the midst of walking your motorcycle and a friend jumps in to help it can upset the balance and steering. This could cause you to panic and drop the bike. Learn to do it yourself. You can also use a friend as a spotter/standing nearby for the first couple tries – just in case. Walking your motorcycle is truly an easy, confident, and professional way of moving or walking your motorcycle around. Take it easy and go slow. 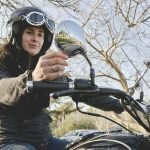 Once you gain your confidence and technique, there’s be no type, size or weight of motorcycle you won’t be able to manage. How about power walking bike on rough terrain or in sand/mud? I’d love to know tips on how to pick up a heavy bike, too!